For volume orders, e-mail info@ManzellaTrade.com. In our ultra-competitive world of new global realities, succeeding in business isn't easy. It requires tough decisions that sometimes involve moving factories to China or outsourcing services to India. But in our current environment of fear and suspicion, these responses often create even more difficulties when poorly communicated to the media, policymakers, employees and investors. The result: bad press, policymakers running for cover, low employee morale and decreased investor confidence. How executives can more effectively communicate their corporate responses to achieve greater understanding and support. 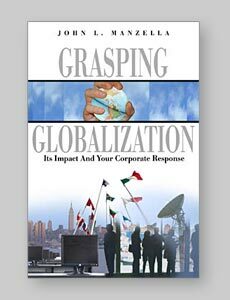 John Manzella, the author of Grasping Globalization, is a world-recognized speaker on global business, competitive strategies and the latest economic trends. His op-eds have been nationally syndicated and his views have appeared in The Wall Street Journal, New York Times, Houston Chronicle, Miami Herald, Dallas Morning News, and Denver Post. John is founder of both Manzella Trade Communications, a strategic communications, publishing and consulting firm, and the ManzellaReport.com, a premier source for global business and economic news and analysis. Have questions? Want to contact the author or receive our free newsletter? Click to view John Manzella's latest speaker demo. Below, click to play video clips in streaming format; ensure that you have the latest player installed, and set it to stream content. For best playback, we recommend a broadband connection. Here's what experts are saying! "Few words are wasted... on-target... combines top-level analysis with nitty-gritty 'how to' tips... will prove useful to both experienced international traders and those who are new to the process." "Not one to shy away from controversy, Manzella helps us grapple with today's most sensitive global economic issues. His answers are honest and stimulating." "Grasping Globalization is a comprehensive, easy to follow resource guide that will help businesses deal correctly with the impact of globalization." "This very compelling book will help executives, policymakers and students understand the new economy. The questions and talking points challenge many prevailing attitudes and viewpoints." "Manzella's in-depth knowledge of globalization will help executives understand its positive impact and how to respond proactively to negative views." Manzella Trade Communications, Inc. © 2002- . All rights reserved.